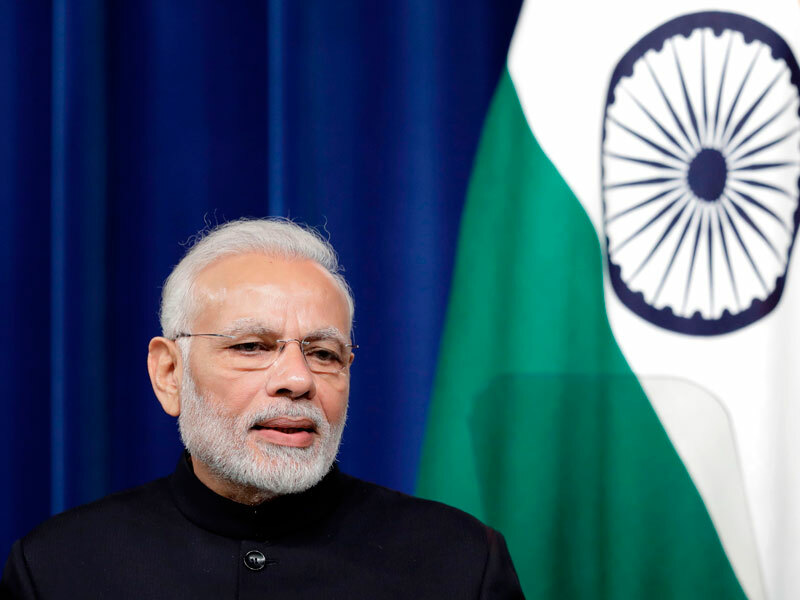 When Prime Minister Narendra Modi contests the Indian general elections this year, he may not be quite as confident as he once was. Although he remains popular – opinion polls in February still placed him ahead of his nearest competitor, Rahul Gandhi – an election that was once viewed as little more than a formality suddenly looks considerably more interesting. Modi remains highly likely to be re-elected as head of state, but his Bharatiya Janata Party (BJP) may have to rely more heavily on coalition partners – a disappointing outcome after making huge gains in 2014. If the troubles facing India’s ruling party are partly due to a more united opposition, they also stem from considerable voter dissatisfaction – particularly concerning some of Modi’s economic reforms. In 2016, the prime minister launched his demonetisation programme in an effort to crack down on corruption. Unfortunately, it also stunted economic growth and drew particular ire from rural, unbanked voters. Another of Modi’s policies, his Make in India initiative, may not have created quite so many headlines, but it too is failing to have the desired effect. The initiative was one of the earliest of his political reign, coming just a few months after his election victory five years ago, but it has not managed to turn India into a global manufacturing hub just yet. Time may be running out – and not just for Modi’s political ambitions. India needs to develop its manufacturing sector rapidly to generate the huge quantity of jobs required to satisfy a young and rapidly growing population. If it doesn’t, voters are unlikely to remain happy with the status quo for much longer. In September 2014, as Modi launched his Make in India programme, he proclaimed it would increase manufacturing’s share of the country’s economy from 16 percent to 25 percent. The proposal was certainly ambitious, but few would argue against its necessity. Approximately one million citizens join the labour force every month in India and job shortages are a common occurrence. In January, a recruitment drive by India’s state railway service received 19 million applicants for 63,000 jobs. While a thriving manufacturing sector would not completely solve India’s employment crisis, it would alleviate some of the strain. Unfortunately, manufacturing remains insufficiently developed. Surprisingly for an emerging economy, the sector accounts for just 15 percent of GDP and 11 percent of jobs. One of the reasons for this is India’s dependence on services instead: long stereotyped as the go-to location for western businesses hoping to host their call centres, India also performs strongly in a number of other market sectors including real estate, insurance, hospitality and retail. 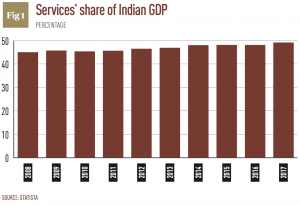 But while services have rapidly grown to account for nearly half of India’s GDP (see Fig 1), this has not been accompanied by a jobs boom on the same scale. In fact, despite its size, the sector provides just 34.49 percent of India’s jobs. This discrepancy between GDP and labour force contribution is unusually stark: in developed countries like the US and UK, the service sector’s impact on GDP and employment is roughly equal. So while India’s performance in the service sector is certainly enviable and has enabled it to boost related exports to foreign markets – a feat that many other developing economies would love to match – this success has allowed the country to neglect its manufacturing sector for too long. Having identified that a more developed manufacturing base would be required to fulfil the country’s labour needs, the Make in India policy initially focused on 25 key job sectors including automobiles, defence, textiles and electrical machinery. It aimed to increase manufacturing’s share of GDP to 25 percent by 2022 and, in doing so, create an extra 100 million jobs. So far, those aims are looking wildly optimistic. Since the policy was initiated in 2014, India’s manufacturing sector has actually contracted slightly, and further challenges could be on the horizon. In January, many of the country’s heavy industry firms raised concerns about potential production stoppages because of steel import limits imposed the previous August. Ironically, the restrictions could mean Indian businesses have to import industrial components rather than raw steel, leading to further questions over the efficacy of the Make in India initiative. Such setbacks demonstrate that it is not enough for economic policies to simply be well-intentioned – they need to actually be effective. Part of the reason why India’s manufacturing sector has struggled is that the country has tried to run before it can walk. Imposing import restrictions is not a bad idea, per se, but it will always prove ineffective when domestic companies are struggling to match the quality, consistency and price of those based overseas. In order to solve this problem, the Indian Government needs to direct more of its efforts to ensuring its labour force has the skill set required for high-quality manufacturing. India’s literacy rate compares poorly with those of China and most of the South-East Asian states, where a concerted focus on improving educational access has borne fruit. In India, education is still often seen as a means of achieving social mobility rather than an economic necessity. Education is currently compulsory until the age of 14, but according to the most recent census, as many as a quarter of under-14-year-olds are not in education. It is perhaps unsurprising, therefore, that just two percent of Indian workers have professional skill qualifications. There have also been policy missteps elsewhere. The goods and services tax (GST), launched in July 2017, has been criticised for being overly complex and, coming hot on the heels of the demonetisation disruption, causing a further slowdown in manufacturing growth. While the long-term impact of the GST may be beneficial to the Indian business climate, the rollout has caused substantial pain. The failure of the Make in India programme so far is not for want of trying. Through a number of reforms, the government has issued incentives to boost the production of smartphone components, military equipment and pharmaceutical products. These initiatives could eventually have their desired effect, but the more fundamental issues facing the Indian economy must be dealt with first. While Kundu is right to say that there have not been many Make in India successes thus far in terms of “actual investment taking place and meaningful progress”, there have been a few minor gains. India has climbed up the World Bank’s Doing Business rankings, rising from 134th position in 2014 to 77th place last year. Although this is the result of broad business reforms, including improvements to credit access and more reliable electricity connections, they will have been particularly felt across the manufacturing sphere. Even though they may have been few and far between, there have been other headline-grabbing achievements. As part of a $100m contract, India has agreed to construct six diesel multiple-unit trains and 10 locomotives for Sri Lanka Railways, the first of which made its maiden journey between Colombo and Kankesanthurai in January. Going all the way back to 2015, BMW increased the localisation at its Chennai plant to 50 percent in direct support of the Make in India initiative. Nonetheless, these improvements are scant reward for Make in India’s grand ambitions. Some advocates of the government policy have claimed the continued increase in foreign direct investment (FDI) should be used as evidence of its success; closer examination makes this claim questionable at best. While it is true that FDI inflows rose consistently between 2014 and 2017, how much of this investment was truly ‘new’ is up for debate. Across 2017, for example, 28 percent of FDI was reinvested income. In addition, services continue to attract a larger proportion of this money than manufacturing. In fact, there has been further evidence that the Make in India initiative may be doing more harm than good to the country’s domestic manufacturing sector. In January, Samsung announced it might have to slow smartphone construction in the country and even stop local production for certain models because of changes to the government’s Phased Manufacturing Programme timetable. Initially, businesses were given until March 2020 to begin the local manufacture of certain components, or they would face a 10 percent import duty and a one percent surcharge. However, a decision to bring this deadline forward would mean it would no longer be in Samsung’s financial interests to continue production at current levels. Evidently, if the Make in India programme is enforced too stringently, it is likely to have the opposite effect to the one intended. No economy can afford to alienate the world’s largest smartphone maker, but certainly not one that is looking to produce more goods locally. In order for Modi’s Make in India policy to gather some much-needed momentum, the Indian Government must look at implementing some fundamental reforms. More flexible labour market rules would be a start. Currently, businesses with more than 100 members of staff must obtain official approval before they are permitted to fire anyone. Overly bureaucratic policies like this must be loosened if businesses are able to grow effectively. Manufacturing firms in India start small and tend to remain that way. A study conducted by India’s Exim Bank found that in the US, a company will grow to 10 times its original size on average over a period of 35 years. In India, the same company would see its productivity only double, while its employee number would actually decline. Given that smaller firms are unlikely to be as productive as larger ones, it’s no wonder India’s manufacturing sector is struggling to take off. The aforementioned state of India’s infrastructure and the country’s shallow supply chain ecosystem contribute to the informality of its manufacturing sphere. Manufacturing in rural areas – where informal work is more prevalent – currently accounts for 51.24 percent of gross manufacturing value added. Here, workers are often without social security protection, and productivity is low. As with the country’s education system, India’s employment landscape is in need of modernising before the government can even think about truly reinvigorating manufacturing. India’s recent turn towards protectionism in its steel industry highlights the misguided nature of Modi’s Make in India policy. Although import tariffs can be an effective way of allowing a domestic industry to develop, this is only true if the groundwork has been put in place first. As it stands, protectionism is simply preventing Indian businesses based higher up the value chain from gaining access to the components they need. India’s future success in manufacturing is likely to depend on how easily it can improve the availability of basic production factors such as land, labour and capital. If Modi’s economic reforms continue to flounder, his popularity among the Indian public may start to wane too. To ensure this does not happen, he should canvass opinion from a wide range of Indian businesspeople, academics and government officials to ascertain where the Make in India policy is going wrong. They are likely to suggest a thorough overhaul of India’s education system, land ownership laws and labour market regulations. Only then will the manufacturing sector be able to attract the domestic and foreign investment it needs to compete on the global stage.